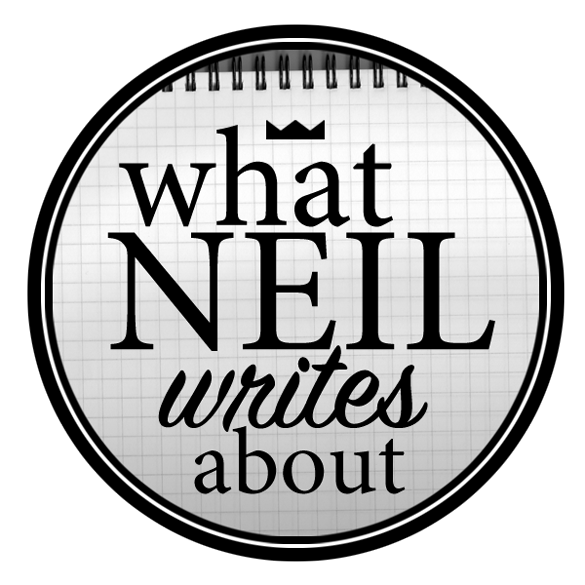 Neil Writes About Burger Geek Molito Alabang! There are so many burger joints out there, and there have been so many disappointing moments I've had with burgers than I have been dumped. There were greasy burgers, there were underwhelming beef patties and there were just burgers that were bad. This resulted in me being absolutely jaded with burger joints. I would always enter a burger place with my heart on my sleeve so I wouldn't get too hurt. 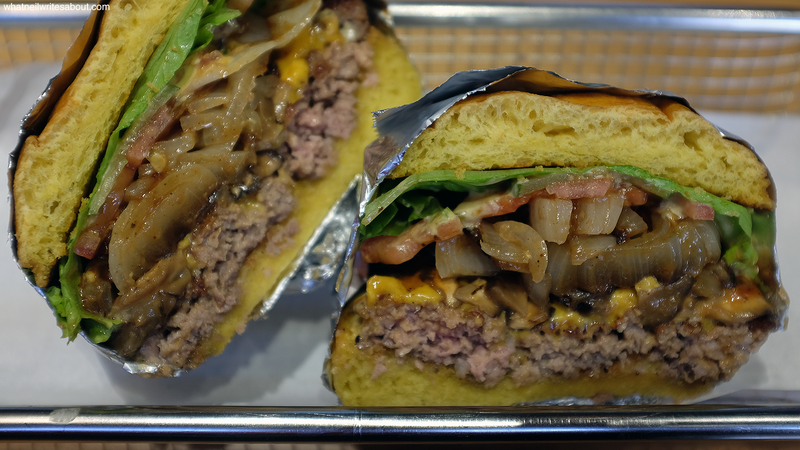 So when I heard about burger geek, I was a little hesitant to try it. Now that I have, I am here to tell you what happened. 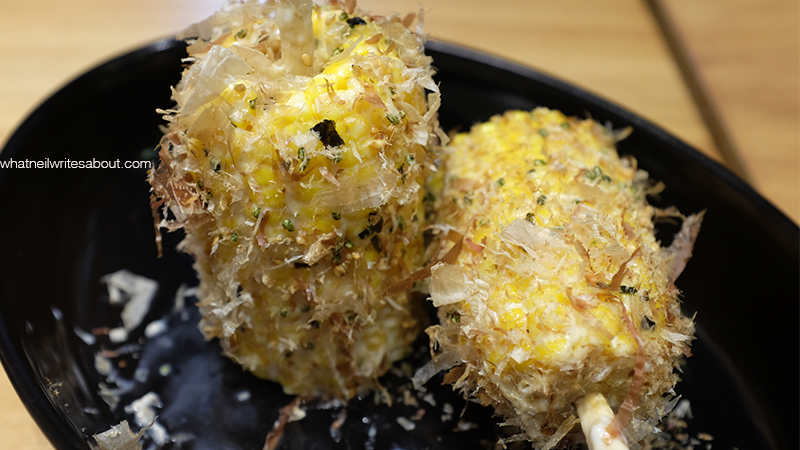 Umami Corn made of Bonito flakes and Seaweed the staple source of umami flavor! The Molito complex is composed of multiple rectangular buildings that were divided into smaller rectangles for the different establishment. In the middle of those Rectangular buildings is a small park with benches and a fountain. The smaller rectangles are similar in size and are usually high enough inside to accommodate two floors. Burger Geek decided to have only one floor with high ceiling. The whole front facade is made of glass so you can see the inside right away. As you enter, the kitchen is right across from the tables and the entrance. The aesthetics of the place is modern rustic with wood, steel and glass as their main materials that have been fabricated into shapes with sharp corners and into clean industrial look. The tables and chairs are mostly made of wood, steel and synthetic materials. They are comfortable but can get less comfortable after a certain period. They really want you to eat and go. This is not new for food that is meant to devoured quickly. The B+ (Bacon +) Crispy Bacon and American Cheese, need I say more? The three of us were welcomed warmly from the door and were lead to our desired seat near the kitchen counter. We were given the menu and were intrigued by the name of the different burger variations. 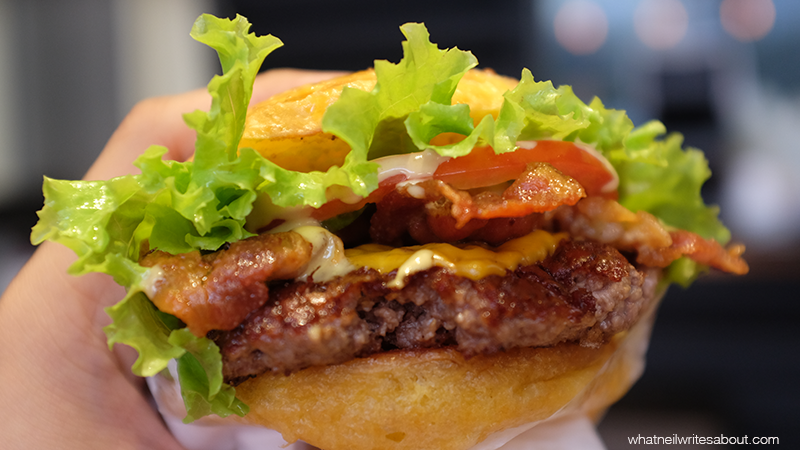 My friend R decided to have the B+ or Bacon + which had american cheese, smashed patty, Crispy Bacon, lettuce and Tomatoes. It is the picture above. This burger was good. It had the staple condiments that blend well together so that it can compliment the beef patty and the soft buttered buns. It's quite the delight. I decided to go with the Straight Aes which was a combination of B+ with Shiitake mushrooms, sauteed onions and BBQ sauce. This burger took the standard 'the Geek' and the B+ to the next level with the mushrooms and the BBQ sauce. This added a savory layer from the mushrooms and a sweet layer from the BBQ Sauce that enhances the goodness from the B+. The Buffalo Chicken Sandwich is oozing with Spicy Buffalo Wing Sauce! And last but not least, G got the Buffalo chicken Sandwich. 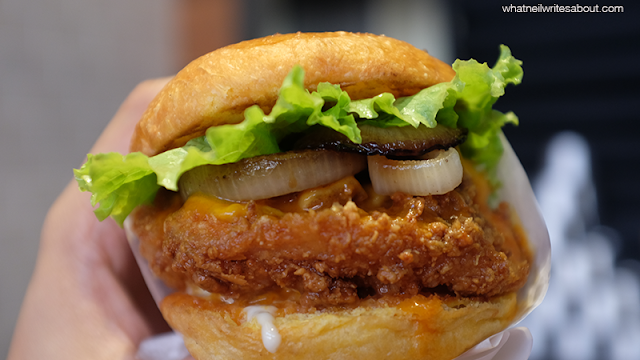 It is like the burger but instead of the smashed patty, Fried chicken with buffalo wing sauce and pickles were added. It was amazing, I love hot wings and making it into a sandwich is an interesting idea. My only concern was that the Buffalo sauce could get a little too oily which can ruin the experience. After the burgers themselves we were so amazed by the food that even though we were full, we had to try their sides. I got the Umami Corn and R got the Mac and Cheese. The Umami Corn is basically an Umami flavor bomb. It had bonito flakes and seaweed (Nori) which were staples of Japanese cuisine. The Mac and Cheese is good. Not spectacular but it was cooked well. The pasta was al dente while the cheese was oozing and the bacon bits were crunchy. Each ingredient was cooked well and made it good. 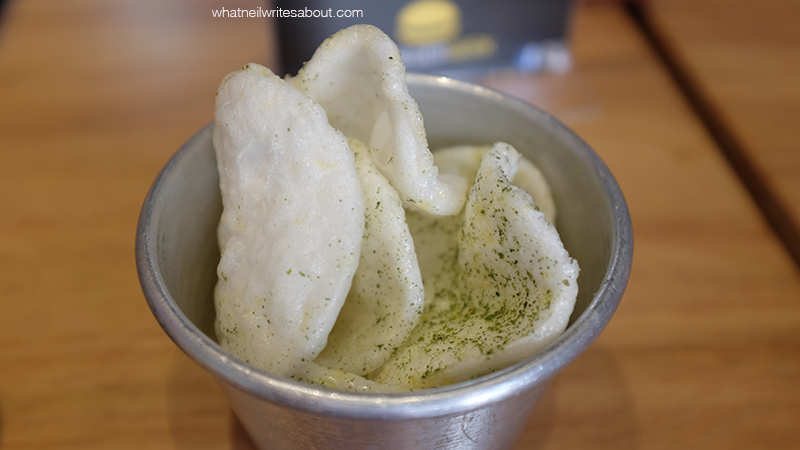 They Give a Bowl of free Kropek when you arrive at your table! When we came one Monday afternoon, the Kitchen crew was numerous while the waiter number was just two or three, which became a concern when dinner time came. Customers flooded the place and the waiters struggled to keep up with the number of orders and requests. The food came ten to fifteen minutes after ordering and the waiters gave us free kropek as soon as we sat down! It was the best Kropek I've had. It's a little far from the pub Kropek you get with your beer during college. 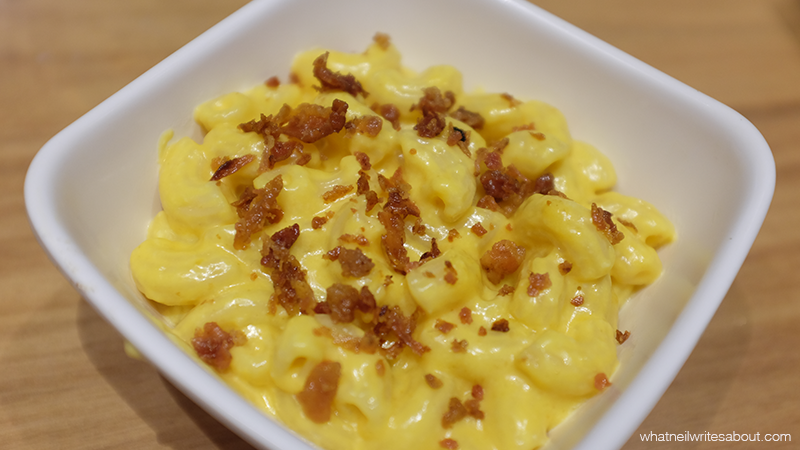 Crispy Bacon on Oozing Mac and Cheese! The burgers start at Php 185.00 (The Principal) and can go up to Php 385.00 (The B. Mac) while the sandwiches start at Php 225.00 to Php 245.00. The sides start at Php 65.00 and can get to Php 210.00 for the 6 pc. Chicken wings. There is the Umami chicken which is made of two pieces of fried chicken, an Umami corn and a choice between rice and korean yang chow. This will set you back Php 295.00. Pricing varies and most are spot on while there are some that can get overpriced. I loved Burger Geek. They give you free Kropek! The place gets full quickly during rush hours! Neil Tries Ramen Yushoken Quick Dish Review!